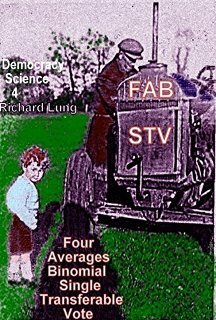 Four Averages Binomial Single Transferable Vote. The study of election methods, like any other science, seeks progress in our knowledge of the subject. Started in the eighteenth century French Enlightenment, there was a steady influx of contributions during the nineteenth century. In the early twentieth century, the state of the art system, the single transferable vote, first championed by John Stuart Mill as an MP in the UK House of Commons, was almost passed in that chamber, after its recommendation by the 1916 Speakers Conference on Electoral Reform. The government broke its promise to endorse this particular part of the package deal. This unlawfulness of the law-makers has been the prevailing story, in the subsequent century. In the wake of a world-wide revolt of the elites, a Professor Pangloss of election method has endorsed the opportunist anarchy of voting systems, as the best of all possible electoral worlds. This academic scepticism has in turn emboldened politicians to rig the electoral rules just as it suited them, rather than the baffled electors. One of the few (I suspect about the only) genuine scientific advance made in the preceding century was Meek method STV. At any rate, this is the point of departure for FAB STV. The first part of the book is for the general reader. The second part is a highly specialised blueprint on how to make the system a living reality. Democracy cannot survive as an exception to the increasingly specialised division of labor. The vote needs voters but the count needs logically counting computers.